The generic term “healthcare worker” (HCW) has been applied to professions as diverse as physicians, laboratory technicians, cleaning personnel, dieticians/food handlers, and even hairdressers. This chapter focuses on the occupational dermatoses that plague the varying medicosurgical specialties, their nursing staffs, and their technical support staff (respiratory technicians, physical/occupational therapists, orthotics, etc.). Problems unique to other groups that work within the healthcare system (dentists, laboratory technicians, veterinarians, food handlers, cleaning personnel) are discussed elsewhere. The types of dermatoses and the incidence with which they affect HCWs vary with each specialty. While the orthopedic surgeon has significant exposure to antiseptic soaps, methyl methacrylate, and rubber allergens, the radiologist has much more limited exposure to these materials while having increased exposure to electromagnetic and ionizing radiation. Furthermore, even within a given specialty, the types of products used can vary dramatically not only from country to country but also from hospital to hospital. Thus, the reported incidence rates of occupational dermatoses (primarily dermatitis) among HCWs vary considerably. 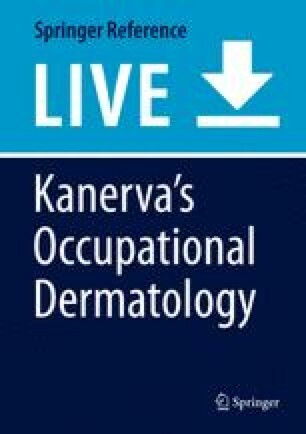 Not surprisingly, however, as a profession, HCWs have a significantly higher incidence of occupational dermatoses than most other occupational groups (Skoet et al. 2004; Kucenic and Belsito 2002; Meyer et al. 2000; Sertoli et al. 1999; Halkier-Sørensen 1996; Stingeni et al. 1995; Rustemeyer et al. 1994; Smit et al. 1993; Kavli et al. 1987; Kiec-Swierczynska 1996). Furthermore, nurses and aides constitute the group at highest risk in most studies of HCWs (Lammintausta et al. 1982; Nilsson et al. 1985; Rudzki et al. 1989; Smit et al. 1993, 1994; Rustemeyer et al. 1994; Stingeni et al. 1995; Halkier-Sørensen 1996). While irritant contact dermatitis (ICD) accounts for the vast majority of occupational dermatoses, allergic contact dermatitis (ACD), contact urticaria (CU), infections, accidental exposure to electromagnetic energy, friction, and other disease processes also significantly contribute to occupational morbidity (Lammintausta et al. 1982; Nilsson et al. 1985; Fisher 1987; Kavli et al. 1987; Rudzki et al. 1989; Smit et al. 1993, 1994; Hirschowitz 1994; Rustemeyer et al. 1994; Stingeni et al. 1995; Halkier-Sørensen 1996; Kiec-Swierczynska 1996; Holness and Mace 2001; Nettis et al. 2002; Suneja and Belsito 2008; Warshaw et al. 2008).